The BORG scale (another rate of perceived exertion tool) allows you to match a number to your perceived exertion. Your range goes from 6-20. Similar to the RPE scale it helps medical personal and personal trainers to objectively document how you are feeling during an exertional exercise. 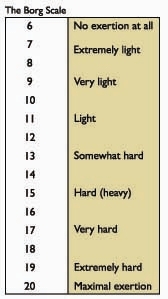 Since perceived exertion can vary greatly from individual to individual, and "easy" may have 101 meanings, it became necessary to be able to put a number behind a word like "easy" or "somewhat hard." This scale and the RPE scale are two widely used scales that accomplish this goal. Depending on the goals, a specific range or number will be your focus.